In 20 minutes Francy and I are leaving for New Zealand. New Zealand has been like a unicorn for me and Francy. It seemed like it’s out of our reach, always elusive. It was our original honeymoon destination. But alas, there was some trouble with our visas, so we were sent back, eventhough we’ve checked our baggage. We’re stuck for a week in Sydney. And a week is too much for Sydney, heheheâ€¦. Our second attempt was a couple of months ago. Everything was set, visas, tickets, hotel bookings, everything. But two days before we leave, Francy had a small red bubble on her arm. Chicken pox. Strike two. Now it’s the time to swing the bat for the third time. And they say three time’s a charm. So far, 15 minutes before boarding, everything is smooth. We pray that this time we will step our feet on New Zealand soil. There’s a little twist in my trip with Francy this time. We’re staying in a motorhome just like this one – in fact that’s the exactly vehicle that we are using. We’re going to shower, cook, sleep in that motorhome, going around and stop wherever we like. 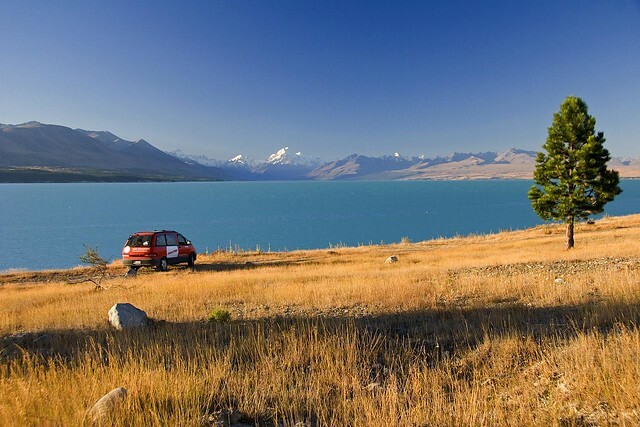 The company that we used has been voted as New Zealand’s best, so we are excited and can’t wait to see the car itself. We’re planning on lots of unscheduled stops, lots of sleeping outside seeing the stars, lots of trekking amongst the land’s famous mountains. It’s gonna be a first for us. First time in New Zealand, first time living in a motorhome (like the one in he picture above) We’re planning to document the trip as much as we can. So stay tuned. Me and Francy, we’re two lucky fellow. We’ve been dreaming this trip of a lifetime since we got married, and we got a chance to make it happen. We thank Him that give us the favor. wow…… sounds so much fun roooad trip!!!! a married couple road trip….. so much much fun! breath that freash air baby….yeaaaaah! Just saw your update today, are you guys still in NZ?! do drop by in Auckland please!! we’ll be so happy to show you around Auckland! It’s been nearly one yr since our wedding in Bali and we’d really like to thank you for all the beautiful memories you’ve helped captured on our special day!! it was your honeymoon,but aniway you’ve made it there!!! So I guess the old saying “There is always a right time for everything” is spot on! !